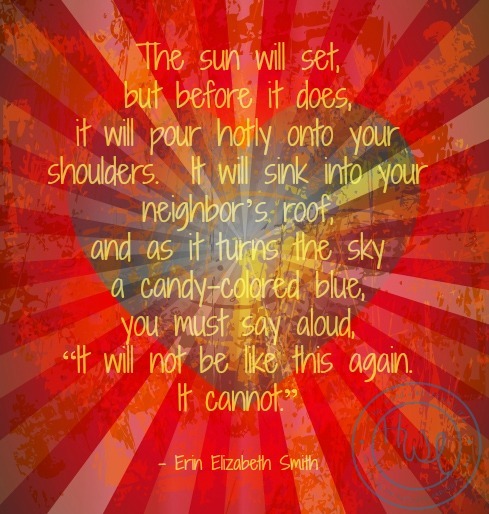 While browsing through a giant word document full of quotes on my old computer earlier today, I came across this poem by Literature and Creative Writing professor Erin Elizabeth Smith. I’m not quite sure when I originally found it, or where for that matter, since most of my google searches have been futile – but I fall in love with it again and again every time I read it. I guess that’s kind of fitting anyways, since that’s what the poem is about. Falling in love. There is something about Smith’s writing that captures all of the beauty and the pain of the process so perfectly – in such a raw and truthful manner – that immediately upon reading her words you are transported and plugged into those deep connections to the entire human experience. When I read them again this morning, I knew I would have to share them with you all today, so you could feel it too. Besides, since it’s almost Valentine’s Day, and I can’t help but get a little sentimental on you all! “Here is where you pack the heart. In a small dark box. A box cut for heart-shaped things. Like a case for a French horn, a crystal paperweight. It can be stored anywhere – in a cool linen closet, in the cat-eyed dark beneath your bed. You may line the box with tissue. You may spin the combination on its fire-proof lock. You may look at it sadly or punch the fist-sized object with your own closed palm. But you must forget it, must not dream about its soprano in the shower, its sleepy Southern lilt. Must think it as you did the possum you ran over last winter – it must be old and sick and feeble. It must have needed to die. Once it is packed and put away, go outside. The sun will set, but before it does, it will pour hotly onto your shoulders. It will sink into your neighbor’s roof, and as it turns the sky a candy-colored blue, you must say aloud, “It will not be like this again. It cannot.” When you do, there will be a moment when you turn back toward your house. You will see something common – a kitchen window, a shovel leaning against your porch – and it will be transformed. There are some who say this is when the heart comes back, a bit bloated, too high in the throat. You might want to cough it up. You might want to touch the doorknob to your house. Hold it firmly in your hand until it’s warm. Then you will turn it. You will turn it slowly. You will go back in. What are some of your favorite love poems? Do you have a favorite poet who writes on the topic? Because I Love You, and Fall!